These days you can't walk the streets of downtown Nashville without seeing an Uber car roll by every couple of seconds. 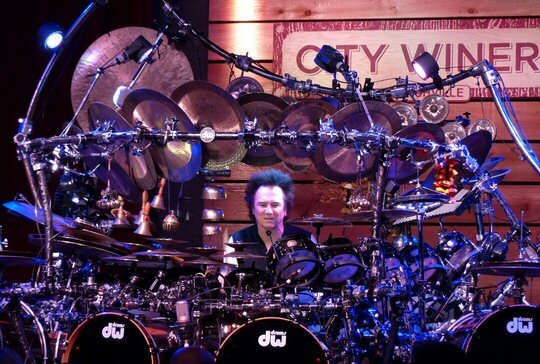 So, in this way it was fitting that acclaimed progressive rock drummer Terry Bozzio brought his uber-monstrous kit with him for his recent show in town. 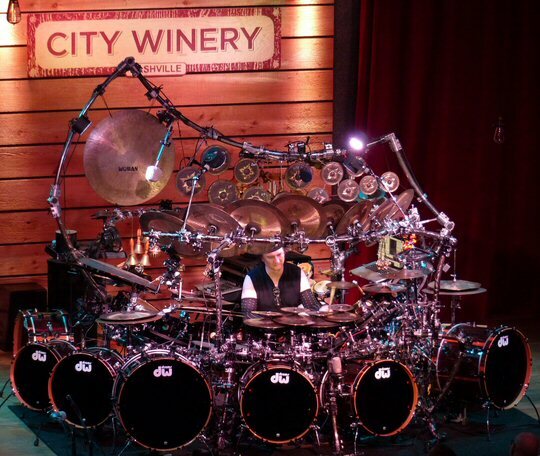 Bozzio's set-up, that some say might be the largest ever assembled, was the driving force behind his performance at the City Winery on September 11, 2016. It's no wonder that when Bozzio asked if any drummers were in the room a show of hands revealed that nearly half of the audience was comprised of percussionists drawn to the venue to witness Frank Zappa's former stickman in action. This pattern continued throughout the night. On "7&7" Bozzio expertly explained the complicated rhythmic patterns and the options he had in performing them. Terry also provided a lesson on the various frequencies that his drums and cymbals are tuned to. But, the education didn't stop there. When he came out from behind the drums he took a seat on a black cajon rhythm box saying that it was amazing that this item is now the best selling musical instrument in the world. Bozzio relayed that the origin of the device came from shipping crates used during the slave trade. Black captives who had been stripped of everything including their family and culture pounded out musical beats on these boxes as they kept their spirit and dignity alive. Bozzio was busily promoting his new "Terry Bozzio Composer Series" box set. 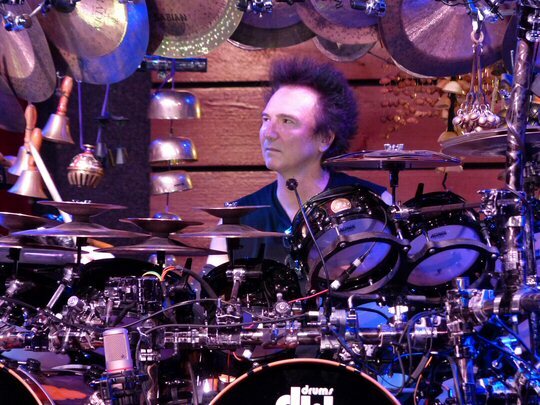 Terry Bozzio is also well-known for his work with Jeff Beck, UK and his own breakout 80's hit new wave band, Missing Persons. He was pleased to announce from the stage that now that he has turned 65 years of age the record companies have been calling for a career retrospective. With that he said the "Terry Bozzio Composer Series" - a comprehensive exploration of his music - will be available later in the month as a box set from Ward Records. Terry Bozzio's - An Evening of Solo Drum Music was a unique, intense, dynamic, spiritualistic, melodic, orchestral, atmospheric, and musical performance on perhaps the largest tuned drum & percussion set in the world. During the Nashville show Bozzio was an enigmatic, evocative and engaging musician who was able to accompany himself with bass note patterns and, at the same time, melodically solo on top with highly developed coordination skills. Combined his expertise enabled him to express a complete musical statement on the drum set alone. Flanking both sides of the stage were examples of Terry's own art work in the form of abstract paintings. Fans can delve further into this side of the man via the "Terry Bozzio Composer Series" complete with 59 Compositions, with 59 Paintings for each title on a 4 CD, 1 live performance/interview/drum setup DVD & Art Booklet in a Vinyl Sized Package that will provide a full immersion into all of the drummer's well-practiced genres - Classical, Fusion, Electronic, Ambient, Rock & Jazz!